We dispute your view that the article was written with “brute sensationalism” in mind. We believe it to be a balanced article, and about as non-sensational as an article dealing with the subjects mentioned in the interview can be. The interview relates accurately and factually what the interviewee told our reporter. Are you familiar with the definition of sensationalism? It is “the presentation of stories in a way that is intended to provoke public interest or excitement, at the expense of accuracy”. You have not pointed out where the article was in any way inaccurate. The article also draws no connected between being a Vampyre and self-harming behaviour. The interviewee volunteered this informaiton as a way to explain how she discovered her prediliction for blood. We suggest you also consult a dictionary for the meaning of “overt”. Not once is any suggestion made that self-harming behaviour is a clue that someone may be a Vampyre, and we feel that no reasonable person reading the interview would come to such a conclusion. You are drawing this inference. There is no more association drawn between someone engaging in self-harming behaviour and being a Vampyre than there is one drawn between someone studying at Wits and being a Vampyre. You mention the dangers faced by those in alternative subcultures, and this is indeed a real problem. But nowhere in the article is there anything which paints Vampyres in a light that would suggest they are dangerous or a threat to anyone, nor is there any mention of Satanism. We stand by our article as fair and reflecting what was told to us by the interviewee. 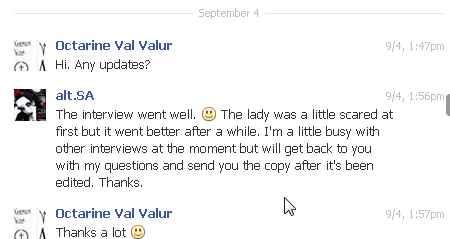 We’re also of course always open to any follow-up interviews! It is the whole of this paragraph which does so, as a chain of associations – and in particular the last sentence which drives the point home, and carries the consequences explained in our first letter to you on this matter. 1. done or shown openly; plainly or readily apparent, not secret or hidden. Perhaps you may be correct on my use of the word “overt” since it is clear from your response that you do not see how easily this connection is formed. Perhaps the subtlety is a bit elusive? The article uses the derogatory term “bloodbag” in referring to a donor. This is the kind of blunder which outrages and alienates donors in the community and offends our sensibilities as a community. It is demeaning and insulting towards the donors, and conveys the message that the Vampyre who uses it does not care for them or their well-being as a living sentient individual, but rather views them as cattle, meat or some lower, lesser life form. It devalues their worth in the community, and it cheapens the value of their lives. Even if used by the uninitiated when in context of the VC, this is deeply disturbing to us. Had we been given the opportunity to discuss this with you before going to print, this could have been explained and corrected. We are indeed familiar with the definition of sensationalism. It seems that you have just described this very article, which provokes public interest or excitement at the mention of Vampyres, blood-letting, blood consumption and is laced with inaccuracies on the topic. The article focuses on bloodletting, the interviewee self-harming, and also feeding from other people, but also drives home the point rather enthusiastically by dwelling on the aspect more than necessary to convey a less sensational message. “…nor is there any mention of Satanism. ” – Although there is no mention of the term “satanism” in the article, Vampyres are one group frequently misassociated with “satanism” by hysterics. It is possible that self-harmers being associated with vampyrism may now also likely be associated with “satanism” by those who do not know better. At any rate, hysterics who adhere to “satanism” conspiracy theories like excrement to a blanket tend to jump on any kind of alternative belief system, subculture or lifestyle with accusations of “satanism” in action. This is the context to the mention of satanic panic hysteria in our previous correspondence. Although it is a minor concern in the context of the article, the interviewee’s nightside name is Rose Dantis, not “Rosadantus”. It seems she even went to the effort of spelling it out for the interviewer, who still managed to get it wrong. To conclude, AltSA approached the SAVA looking for Vampyres to interview and SAVA played intermediary by passing along the request. The interviewee (Rose Dantis) approached the interview in good faith based on the assurances made by AltSA via the SAVA, who also acted in good faith. There was an agreement… that was violated. There was an agreement between AltSA and the SAVA. AltSA agreed to provide us with a preview of the article before its release. If the agreement reached between us had been adhered to, these misunderstandings would have been clarified and the resulting blunders could have been avoided completely, without infringing on the “creative license” of the writer or your publication. Instead, the education of journalists writing about the Vampyre subculture is now being conducted at the cost of the Vampyre community. Going back on an agreement violates trust. Trust is, as I am sure you know, vital for many in alternative lifestyles and subcultures to participate, interact and exchange information. Without trust, I sincerely doubt that any participant in the VC would consider an interview. I believe this makes our point sufficiently clear? This entry was posted on Tuesday, December 3rd, 2013 at 10:14 am	and tagged with AltSA, bad press, interview with a vampire, interviews with press, SAVA and posted in News. You can follow any responses to this entry through the RSS 2.0 feed.